The pure and innocent bond of love between a brother and a sister is one of the deepest and noblest of human emotions. 'Raksha-Bandhan' or 'Rakhi' is a special occasion to celebrate this emotional bonding by tying a holy thread around the wrist. This thread, which pulsates with sisterly love and sublime sentiments, is rightly called the ‘Rakhi’. It means 'a bond of protection'. The ritual is observed on the full moon day of the Hindu month of Shravan, on which sisters tie the sacred Rakhi string on their brothers' right wrists and pray, for their long life. Rakhis are ideally made of silk with gold and silver threads, beautifully crafted embroidered sequins and studded with semi precious stones. The strong bond represented by Rakhi has resulted in innumerable political ties among kingdoms and princely states. The Indian history testifies that the Rajput and Maratha queens have sent Rakhis even to Mughal kings who, despite their differences, have assuaged their Rakhi-sisters by offering help and protection at critical moments and honored the fraternal bond. History has it that the great Hindu King Porus refrained from striking Alexander, the Great because the latter’s wife had approached his mighty adversary and tied a Rakhi on his hand, prior to the battle, urging him not to hurt her husband. When Queen Karnawati, the widow of the then King of Chittor realized that she could in no way defend the invasion of the Sultan of Gujarat, Bahadur Shah, she sent a rakhi to Emperor Humayun. The Emperor touched by the gesture, accepted the rakhi thereby accepting Queen Karnawati as a "sister" and immediately started off with his vast troops to protect Queen Karnawati. There is an incident that involves Krishna and Draupadi, the wife of the Pandavas. She had torn a strip of silk off her sari and tied it around Krishna's wrist to stop the flow of blood. Krishna was so touched by her action that he found himself bound to her by love. He promised to repay the debt and then spent the next 25 years doing just that. Draupadi in spite of being married to 5 great warriors and being a daughter of a powerful monarch only trusted and depended wholly on Krishna. King Bali was a great devotee of Lord Vishnu. Lord Vishnu had taken up the task to guard his kingdom leaving his own abode in Vaikunth. Goddess Lakshmi wished to be with her Lord, back in her abode. She went to Bali disguised as a Brahmin woman to seek refuge till her husband came back. 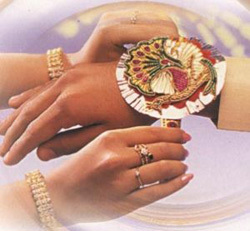 According to another legend, Raksha-Bandhan was a ritual followed by Lord Yama (the Lord of Death) and his sister Yamuna. Yamuna tied rakhi to Yama and bestowed immortality. Yama was so moved by the serenity of the occasion that he declared that whoever gets a rakhi tied from his sister will become immortal.